My family and I revisited San Antonio , Texas this weekend. My son was only 1-year-old when we first encountered the charming Riverwalk, a network of walkways along the banks of the San Antonio River. It is lined with bars, restaurants and shops. It’s a fusion of the rich, old , fascinating historical landmarks bringing into mind a nostalgic romantic side of the past to that of the exciting urban structures of the 20th century. A very close encounter with another boat. Easy my man, we have all the time tonight! There's so much bars and restaurants to choose from. Bells on the wall behind the stage where music and dancing are performed. 750-foot-tall Tower of the Americas provides the most breathtaking view of the Alamo city. Guests can dine at the revolving restaurant or have a grand time watching the panoramic sceneries at the observation deck. The Riverwalk are two parallel sidewalks that winds and loops under bridges. It’s like the Texan version of Venice. It connects to the major tourist draws from the chic Rivercenter Mall to the famous Alamo which for 13 days in 1936 was held by 200 Texan defenders who fought courageously and offered their lives for the price of liberty against the more than 1,000 troops of Gen. Santa Anna. Seeing the Alamo reminded me of the men and women who continually fights for our freedom and democracy up to this very day. My son is a fan of the army and he wants to be a soldier when he grows up. I asked him why and with a child-like innocence he said, ” because they ride cool trucks.” I admire him for being vocal about his dream but it scares me to think of what that means in the future. I just can not imagine what parents feel today when their children are sent off to war-torn places. Much as we our proud of their heroism, bravery and patriotism, there’s always the fear that they may never come back. He’s only 5 but time flies quickly . Before I know it, he will be 18 and has wings of his own. My son enjoyed the boat ride. He was amazed by the lighted tall buildings. We saw other interesting architectural structures like the Arneson River Theater, the San Antonio Museum of Art and the Pearl Brewery but the one that struck me the most was the optimistic, friendly and happy attitude of both the local residents and the tourists. There was this one woman along the side of the strip who waved at us and shouted, ” I love you all , I love you all.” I was tempted to shout back for silliness sake, ” I love you too,” but my wife was next to me. She would probably laugh and thought it was the low sugar that’s causing me to talk crazy. The beckoning of the Twin Towers. This tree witnessed 300 years of history. My son finished most of the pasta. It's one of his favorite food. We went back to our hotel tired but appreciative of our visit to the Riverwalk. We just made new memories with our son whom he’ll remember in the years to come. After our night-time prayers, I tucked him in his bed. We’re having another big adventure the next day at Six Flags. My son was all excited and so am I. It was time to call it a night. We will definitely come back and make new discoveries on our next visit. Thank you for reading this post. I hope it reminded you of a wonderful place that once held a special place in your memory. This entry was posted in photography, Travels and tagged Alamo, Architecture, Army, Art, Arts and Entertainment, Blog, Business and Economy, Children, culture, Design, Environment, Events, Family, Food, Fun, Funny, garden, History, Home, Houston, Inspiration, Kids, Life, Lifestyle, local, love, Mall, Metro Areas, Music, Nature, News, personal, Photo Galleries, Photography, Photos, random, Riverwalk, San Antonio, San Antonio River Walk, Shopping, Stories, Texas, thoughts, Tower of the Americas, Travel, United States, Venice. Bookmark the permalink. Thanks Angie. You will never regret it if you visit this place. And they do have a lot of authentic , delicious food that you could try and share in your blog which by the way I enjoy reading. Keep me updated if you’re visiting Texas. Have a great day. Great post! I’ve always wanted to go to San Antonio and see the riverwalk. It looks so wonderful! HI, Thirdeyemom.Thank you for the comment. I wish you could visit this place one day. It is beautiful with a lot of history. I’m always fascinated by the areas you travel. The way you described them gives it life . It’s a joy to see your new post each time. Happy travelling and thanks for sharing . Hi Christy, Thanks for the nice comment. It has modern and old charms . They were able to preserve structures as old as the Alamo but people like comforts I guess so, there’s huge hotels everywhere. I did see a lot of old couple walking hand by hand or sitting at a corner enjoying the view of the river and they seem to be having fun. They reminded me of my mom and dad. What a small world that your mom is from Houston. She probably saw more of Texas than I did. San Antonio has a lot of old historical places to visit and I hope to venture on them someday. Thank you again and have a great day. Thanks for the comment. Yes, my son is crazy about pasta specially macaroni and cheese. The boat ride was a lot of fun . The first time we did it was daytime and the ride is really cool at night with the lights and all. It looks like you know all of the hot spots. The Riverwalk does look pretty impressive, as does the food. Keep it coming man, I enjoy reading your blog. Thank you, Frank. I’m planning to explore Texas more this summer. They say that there’s a lot of nice places to visit at the Hill country like Austin and surrounding areas. I enjoy taking pictures and sharing them. It reminds me of the good times that me and my family had in our travels. It’s always a new discovery to read all the blogs that I included in my links. Sometimes I would spend a few hours reading each one of them. thanks for sharing. It seems like a great place to visit. Hi, Richard, thanks for the comment. It is a scenic place to visit. We’re planning to go back in July to visit the other historical places with my in-laws. We went to six flags the next day and it was a lot of fun. I have never been to TX. I was going to go at the end of july but changed my plans. July gets really hot in Texas. To enjoy the outdoors, Spring or late fall is the best weather for venturing it’s scenic and historical locations. It’s a fun place to visit. I just recently been into exploring it more since my son started to be curious and adventurous of his surroundings. I missed the Hill country’s wildflowers and blue bonnets this early spring, maybe next year. I hope you can visit Texas one day, I think you’ll like it.Thanks for the comment. I’m learning a lot reading your posts. I’m new with wordpress and I’m just trying to discover it’s potentials. Hi, Frizztext. That is true that an ocean is way vast than a river, and Venice itself is an enchanting place that Romance , Art and Poetry has drawn inspiration upon but until fate would lead me to visit this dreamy place, I’m happy that I’ve rediscovered this little gem of Texas. I’m a simply guy and I get wowed so easily. Thank you for commenting back.It’s much appreciated. Hi, eof737. Thanks for commenting back. It was my pleasure to have read your blog. It was enriching, fun to read, full of optimism and motivational food for the mind and heart. I’m glad we got connected as well. Looking forward for new discoveries with you and your blog. Have a great day! Have a restful Memorial Day! Thank you.I had to work this Memorial weekend but I’m off for the big day itself. My wife wants to do some gardening while I want to go to Galveston beach.My son loves the beach- a lot ! May be we can do both. Have a great Memorial Day my friend! What a nice post. I can understand your concern to your son because I have two daughters. These architecture are interesting to me. Thank you for your continued help. Your always welcome. I was more than glad to share them . I wish I had more time to check each one of them during day time but we went to Six Flags the next day so my son can have fun with the rides and the water park. Thank you for following my journey. I will sure do follow you wonderful posts.By the way, I love the black and white picture of your 2 daughters, they walk like my son. I enjoyed reading your post describing the Riverwalk in San Antonio, Tx – it sounds very interesting and a fascinating place to visit. Great photos too, and I see your son enjoyed himself – especially the pasta! Thanks for your warm comment on my blog, I’m so glad we connected. HI, Barb. Thanks for commenting back. Yes, the Riverwalk is fascinating. I would like to go back and check each of the famous architectural buildings that I saw someday. You reminded me of my cousin in the picture with her 2 precious dogs. They are her babies and they’re cute just like the one’s you have. Beautiful photos! I can almost envision myself actually being there taking in all the wonderful sights. It appears that San Antonio has much to offer. Just out of curiosity, is San Antonio “vegan” friendly? Are there many great vegan/vegetarian restaurants in the area? Anyway, thanks for sharing all the lovely photos. I hope you get a chance to drop by my blog too! Have a wonderful holiday weekend! Hi, Donna. Thanks for the nice comment. San Antonio does have a few Vegan Restaurants. I did some research and the following have good ratings: The Cove, Green Vegetarian Cuisine and Coffee, Turquoise Grill. I hope you got to visit San Antonio someday. I did check your blog and I admire your affection and respect for the animals specially the cats. You have a great blog and it makes the readers feel about what you’re passionate about. Your About says you’re from Florida. My family had been to Orlando twice and it’s always a fun experience for us. I just love the tropics! Awesome! Thanks for all the information. I would like to visit San Antonio one day. It seems like a wonderful city. By the way, I love your blog too. I will be checking back often! Thank you Donna. Hope you had a wonderful Memorial Day weekend. If you get to visit Texas someday and see San Antonio, I would be glad to share with you the beautiful places that I visited. It was nice to meet you through your blog. Have a great day. Thanks Shivya. I have a wide imagination just like my son but I wish to see Venice someday. For now I’ll make do of what’s around me. I’m glad you like the Virtual tour. God Bless Texas and all she has to offer! Just love it! It’s always fascinated me how much Texans love Texas, you don’t get that kind of love from residents of other states. I’ve heard people say they love their state but it’s never as intense as a Texans love for Texas. One of the greatest gifts you can give to anyone is the gift of your attention and time. Looks you all had quite the sight seeing tour. I’m envious! Making memories with the family, a man can’t get much richer than that!!! Great snapshots too. That is true, Texans are proud of their heritage and what this state has to offer. I moved here in 2006 and I already embraced the Texan lifestyle. I may not wear those cowboy get-up but I can definitiely say that I’m feeling that Texan Vibe! My 5 -year old son thinks his Texan. He loves saying ” howdy!” There’s still so much to explore and I just wish I have more days off for that. I’m glad you liked the pictures. It’s a good way for me to preserve those priceless memories . Thank you for the inspiring comments. This brought back such great memories for me! We lived in Houston for 6 years and would visit San Antonio. I love it there. I miss Texas. What a small world! Texas so vast , there’s so much to discover. Any suggestions. It looks like you’re more close to the beach now, and I’m happy for you. I like the picture where you’re strolling by the sea shore with your love one. Thank you for the reply. Have a great, sunny day! 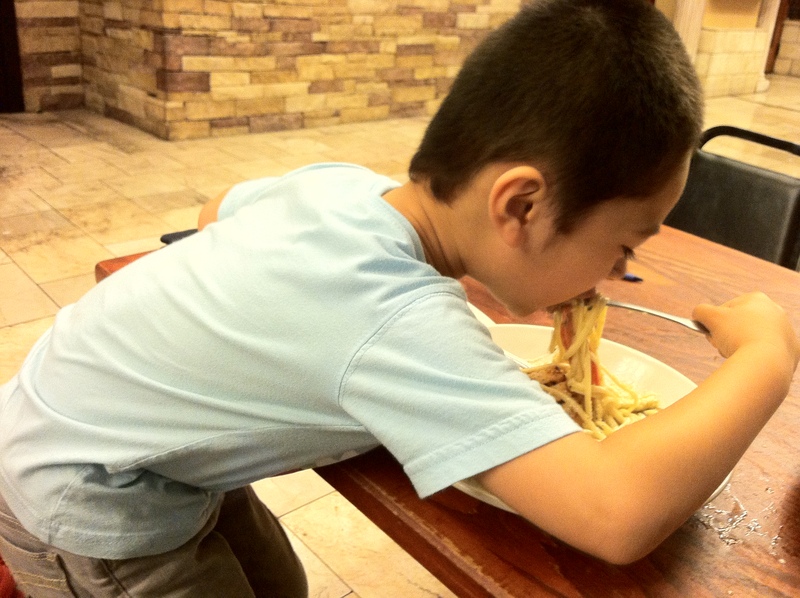 It was neat to see older photo’s of Adrian and now this post with him eating pasta! What a nice change. Our children grow so fast. I think you need to be a photographer! Your photo’s are so clear and beautiful. That is just one thing I am not great at. It’s a pleasure to get to know you and stop by your blog. I can’t say I’m too impressed at what San Antonio has to offer. It wouldn’t be worth the trip, unless I felt that I had somewhere exciting to be at. Almost any city has lots to offer such as that. There’s always going to be tall buildings, malls, and boat rides. Even though some of the attractions are historic, it’s only as memorable as you are at the time that you saw it. If I decide to travel, I expect more fun than that, especially if it’s 1000 miles away. Well, we side tripped to Riverwalk the night before Six Flags which is meant for my son. the Riverwalk was for me and my wife, plus we were so hungry and we needed a great restaurant after the 3 hour drive. I’m easy to please. If show me a 200 year old tree I would probably say, ” Wow.” thanks for the comments, I do appreciate each one of them. I do admit though, if you had spent a few more days there, there would have been something else worth putting into this entry I guess. Only you would know what San Antonio is like, because I’m sure you would have thought about adding more if you did more stuff there. I’m sure if I felt like it, I could just look it up on wikipedia, right? Exactly. Thanks for all the comments. I wish I could have stayed longer but I only had a 2 days off. Had to make do of what time I had. May be I’ll get lucky next time and it will be longer. I would love to check the museums, the brewery, the zoo, etc.